There’s some special magic on the gulf coast in the summer time. The breeze, the humidity on your skin, iced tea and citrus. And there’s no better way to embrace it all on the weekend than sampling your way through a farmers’ market. From the local honey to the freshly roasted nuts, I relish working my way through eclectic collections of doers and makers – and often leave with more than I bargained for. And personally, my idea of a divine Saturday includes strolling through the Venice Farmers’ Market downtown. Its current location is nestled along Centennial Park – although its slated to change in the near future for a citywide renovation project. For now, when I’m walking through the market, I can’t seem to resist lingering at each and every stall, getting to know the goodies each vendor has to offer. My favorite Saturday routine goes like this: I wake myself up with a cup of coffee and read the news, hop on my bike, and head on over to the market before the heat picks up and the vendors shut down at noon. My first stop? Island Organics. A health-centric smoothie and juice spot with a brick and mortar storefront near Centennial Park, Island Organics is an invigorating treat on a Saturday. Their fresh juices and icy smoothies help keep me cool under that brutal summer sun on market days. I savor each sip while I wind my way through the market, taking in all there is to see and smell. The vendors are dynamic and kind, and I love the feeling of losing myself in the social bustle of buying and selling, not to mention that grounding sense of community that markets so uniquely offer. And although this market is quaint – being in Venice, after all, its no Miami market at Coconut Grove – don’t let its intimate size fool you. There’s a lot to see there. Every time I wander by the stalls and savor those smells and sounds, I have to admire how diverse the offerings are. There aren’t many farmers’ markets where you can watch someone make paella, buy an air plant, and then go stock up on some locally grown maitake mushrooms. Especially somewhere the size of Venice. 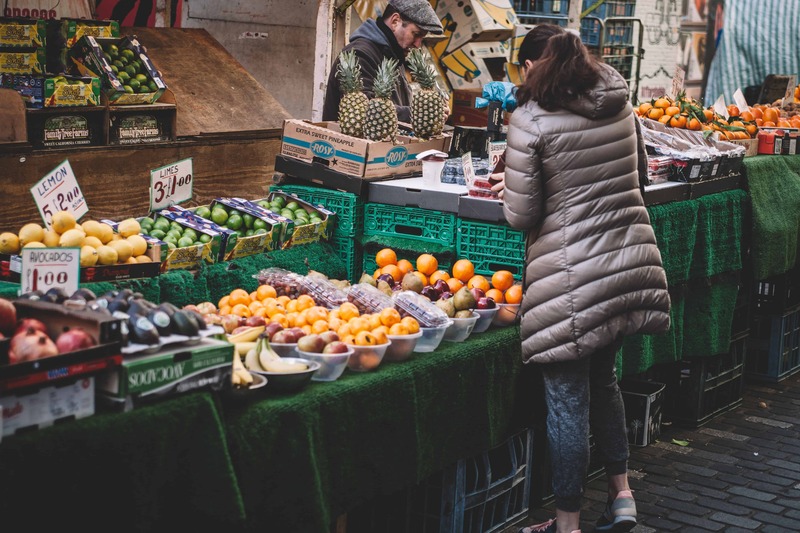 At this market, it’s easy to stock up on all your fresh veggies, as well as indulgent nut butters, tea blends, and those citrus trees you didn’t know you needed for the front yard. On one of my more recent visits to the Venice Farmers’ Market, I biked there to pick up a few veggies and mushrooms for the week – and that beloved smoothie. I ended up leaving with my totes weighed down by fresh produce, a pound of local mushrooms, some new earrings, and a loaf of bread – that I ended up tearing a hunk from and eating on my walk back to my bike. Let me tell you, biking home with everything in my baskets was no easy feat. But I can’t seem to resist coming back and doing it to myself all over again. When the weather’s more forgiving than it is now, I love checking out what Blooming Grove Nursery has to offer. I love looking for that special something I can possibly squeeze into my garden, to get a bustling crop going for myself in cooler months. When it’s hot outside, I can’t seem to keep anything alive other than tomatoes at the peak of the scorching summer! Which brings me to one of my only, inevitable criticisms about this market: the off-season hours are so brief, from eight to twelve. Since it ends at noon, sometimes it’s difficult for me to get myself in gear and bike on down before the vendors start to pack it up for the day – after a long week, I want to relax a little in the morning! However, I can’t really hold it against the market when 95-degree heat is blistering off the pavement; I can’t imagine they get much foot traffic after noon! But I wonder how – and if – that foot traffic will change when they temporarily relocate to outside City Hall on July 9th. Because of all the renovations downtown, the market can’t stay where it is. The market manager, Lee Perron, said he was open to a relocation for the long haul – but that the City Hall spot was definitely a temporary fix. I’ll certainly miss this spot the market’s at now, but I have faith in these vendors and the market community to keep things thriving as we all adjust to a new place to indulge in our favorite local wares. Wherever they end up relocating in the long run, you can guarantee I’ll be heading down there to sample my way across the market, meeting vendors new and old. If you find yourself in Venice, it’s an absolute must to visit and see all the local community has to offer! There’s no better way to get to know a town than their farmers’ market, and Venice has one you don’t want to miss. Have you been to the market? Who was your favorite vendor? Let us know in the comments! What Should You Know Before Using Bird’s Eye Chilli in Your Cooking?